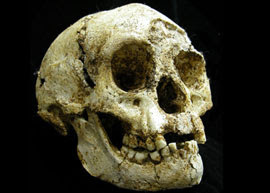 New analysis by a team led by Australian National University doctoral student Debbie Argue showed that Homo floresiensis, nicknamed hobbits, were early hominin and walked out of Africa to Flores. Their findings supports the argument that Homo floresiensis had a unique wrist anatomy that originated from a lineage that lived long before the common ancestor of Homo sapiens and Neanderthals. With Mike Moorwood from University of Wollongong and Thomas Sutikna from Indonesian Center for Archaeology, Debbie Argue compared 60 skulls and skeletal features from two individual hobbits to those of hominins, chimpanzees and gorillas using cladistic analysis. The result shows that Homo floresiensis “probably took one of two evolutionary paths from Africa to Flores. One began 1.66 million years ago, the other 1.9 million years ago”.